Lucky Lady’s Charm Deluxe is another bestseller in the Novoline slot seriesfrom Novomatic, German gaming technology creators. 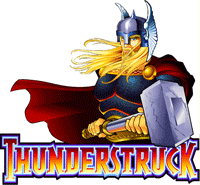 The game was originally launched with 9 paylines. The olineDeluxe version offers 10 paylines across 5 reels, as well as numerous bonus rounds. 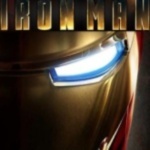 In all, you have many chances to win the jackpot in this game, that is, if the Lady Luck favors you. Click here to play Lucky Ladys Charm now, or read this review to find out more. Lucky Lady’s Charm is a luck themed game. Symbols include the Horseshoe, Four-Leaved-Clover, Ladybug, Crystal Ball and the Lady Luck herself, as well as the usual A, K, J, Q, 9 and 10. 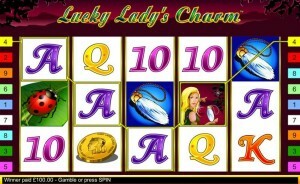 Lucky Lady’s Charm Deluxe offers 10 paylines across 5 reels. The aim of the game is to complete a combination of same symbols appearing in succession from left to right across adjacent reels. Wining combinations typically include 3 – 5 same symbols, but 2 Lucky Lady’s or Ladybugs are enough to complete a wining combination. While as a rule symbolsmust appear on adjacent reels in order to achieve a winning combination,the exception is the Crystal Ball Scatter symbols. 2-5 Scatter symbols anywhere on the reels constitute a winning combination. Lucky Lady is aWild symbol (much like the Joker in card games) and it substitutes for all other symbols in creating wining combinations, accept for the Scatter. There are no “hold” or “nudge” options in this game, and spin results are cannot be “manipulated” by the player. The Autoplay option allows the player too spin automatically for up to 50 spins. As mentioned before, Lucky Lady’s Charm Deluxe offers 10 paylines. The number of paylines is not fixed, and the player can adjust the number of active lines at any time, by using the “+” or “-” buttons at the bottom of the screen. The bet per line is also adjustable by using the “+” or “-” buttons at the bottom of the screen. The total betting range is between 0.40 and 100.00. The number of active line, bet per line and the total bet remain visible at the bottom of the screen throughout the game. 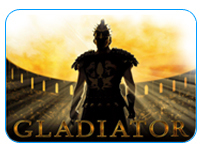 Gamble feature – the Gamble button is activated automatically every time a winning combination is hit. Click the Gamble button to play the Gamble round, or the Collect buttonto continue the main game. In the Gamble game the player if offered a double or nothing” bet option. The player can double his winnings, up to 200.00, by guessingthe color of the next card drawn from a deck of cards. The last 6cards drawn are shown at the top part of the screen. Free Games – a combination of 3 or more Crystal Ball Scatter symbols anywhere on the screen wins the player 15 freegames. But that’s not all, as more free games can be won during free games. Bet level and number of lines in free games are the same as in the main game. Multipliers – in Lucky Lady’s Charm Deluxe, all bonus rounds winnings are tripled! In addition, any winning achieved with the help of one or more Wild Lucky Lady symbols are doubled! The Paytable shows the payouts for every wining combination for the selected bet level and number of lines. 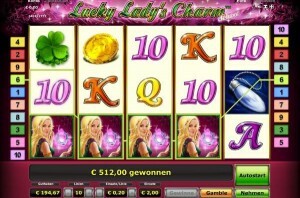 Lucky Lady’s Charm is not a progressive slot game. However it offers the hefty maximum jackpot of 9,000 coins, which is a great incentive for players. In addition, the theoretical rate of return to player (RTP) stands at 97.10% the highest of al Novoline games!giving players an excellent return. All in all, Lady Lucks offers players many options to win in this fun game from Novomatic.